French Emblems: Emblem: Assiduitas duri victrix. Continui, semper Susia gens coluit. Edomat? huic cedunt omnia, dura licet. The Susius [Suys] family always honoured three rammers made of gold, a monument to constant toil. Persistent effort, and skilful hard work - what can they not overcome? Everything, even if it is hard, will yield to that. Intelligence and hard work: how strong they are, how capable of penetrating and pervading anything! If diligent and tireless persistence is applied to anything, and you hammer away at that anvil with unceasing effort day and night, applying yourself to the job, then who knows what polished and complete masterpiece (a sphere as perfect as imagined by scientific theory) must needs emerge from it. That saying is old and accords with what is true: ‘I brought down an oak with repeated strokes’, meaning with unceasing and untiring application, with which any path however difficult can be conquered, no less, and completed; with Herculean or Thesean labours, anything, however tough, and ultimately even heaven itself, lies within your grasp. Truly it is said, ‘Indomitable labour conquers all things’. With stakes and posts, driven with rammers, we see the soil of the earth itself and ‘our secure seat’ (as Hesiod poetically calls it) driven through. These stakes, the insignia of the family Susius, but at the same time symbols of persistent effort, I should wish you to fix in your heart, Peter, my son, so that should weariness ever hold you back, despair may never prevent you from making the summit; but rather that you may aspire through honourable emulation to the glory of the example set you in your own house, and the praise you will have inherited, through diligent hard work, which, undertaken at your hands night and day, will render all your obstacles easy to pass over, and the birth [of your enterprise] will be blessed with success. 1. The son of the author. 2. 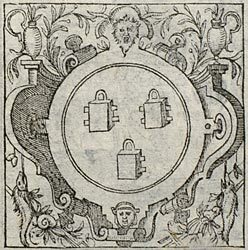 The Susius or Suys family, represented by Cornelis and Jacob as dedicatees amongst these emblems (numbers 9 [FJUb009], and 17 [FJUb017]), were prominent in the government of the Low Countries in the mid-sixteenth century. Their coat-of-arms was three gold drop-hammers on an azure field, heroicising the tools used by the Dutch to pound long poles into the wet ground of their reclaimed land. 4. ‘Evademus in summum’: Quintilian, Institutio oratoria 12.11.30 (an unusual usage of evadere). 5. Lucina was the goddess of childbirth.